A woman has died and a girl has been seriously injured after being hit by a car transporter. The woman was declared dead at the scene and the girl was airlifted to Birmingham Children's Hospital with pelvic injuries, where she is stable. Another child walking with the pair was uninjured in the crash, which happened on Western Road, Stratford-upon-Avon at 08:45 BST. 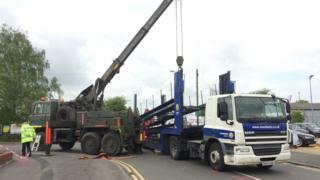 West Midlands Ambulance Service said the transporter driver was uninjured. "Ambulance staff would like to praise the bystanders and, in particular, the staff from a nearby car dealership for their help and assistance at the scene," the service spokeswoman added. Eyewitnesses told the BBC they saw the little girl walk out in front of the car transporter and the woman jump out to try to save her. A spokesman from Manheim, whose transporter was involved, said: "We are working with the police and fully support their investigation. We understand that our driver is a witness and no arrests have been made." Police confirmed there had been no arrests and an investigation was under way.